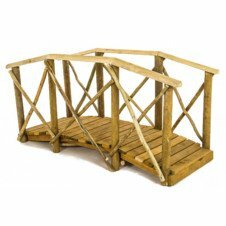 Our garden bridges are perfect for both large and small gardens. You can place it over a fishpond or use it as a short pathway. This feature adds a unique aesthetic to your outdoor area. Whether you have children who love nothing more than to play in the garden or you simply spend a lot of time in your garden by yourself, a timber bridge will make all the difference. The solid structure and functional design mean that our garden bridges are not just visually appealing but also safe for use.